I heard an interview on the radio yesterday. The interviewee was explaining how there was so much money to be made in providing treatment drugs for a disease that there was no incentive for the pharmaceutical company with the best research on that disease to come up with a cure. It’s like the opposite of the “teach a man to fish” idea. And there are those who would claim the cost of our anti-virus software helps fund the development of computer viruses. For every force there is an opposite force. But when it comes to circular business models – providing both the problem and the solution from opposite sides of the same organization, my favourite example is the hole men I used to see in Colombia. 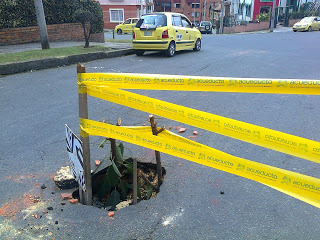 At the time I lived in Colombia, the state of the roads was pretty rough. Even on the freeway it wasn’t unknown to come across major pot holes. I used to classify them by what would comfortably fit in them – a poodle sized hole, a sheep sized hole, a cow sized hole…. it saves the cost of installing traffic calming measures at least, as everyone has to be vigilant while driving. Some of these holes were in built up parts of cities where they compounded the already terrible traffic – generated in part by an apparent love of gridlock and the macho refusal to give way. At any cost. I noticed that sometimes poorly dressed guys Would be diligently filling in the holes with earth and rubble. Passing drivers wound down their windows to hand over a few coins in appreciation. I liked the idea, a bit of practical effort and financial recognition. Seemed like a win win and I commented on it to Mauricio, the local manager in Cartagena.